Take a look back at the most popular wedding trends, from attire to reception décor to cakes, starting in the early 1900s. In the early 1900s, the customary wedding dress featured an S-shaped corset, which drew in the stomach and pushed out the bosom, an effect emphasized by frills on the bodice. Gigot sleeves were popular — wide, puffy sleeves that tapered to a narrow forearm. While white was still the color of choice for affluent brides, due to Queen Victoria's trend-setting gown in 1840, other brides opted to wear azure, mauve, or pale pink. High waists, high collars, long trains, long gloves, and veiled hats also were in fashion. 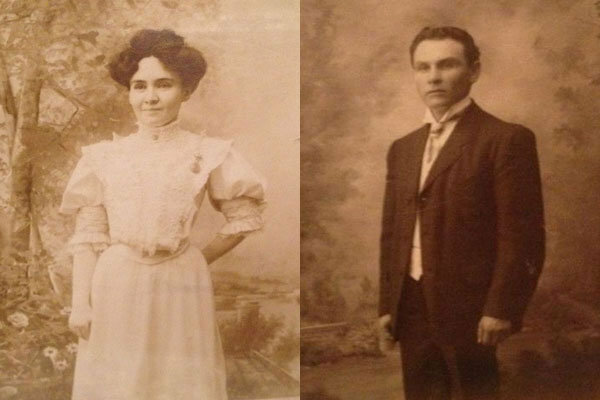 Pictured: Frieda and Samuel Bernstein, married in 1902. The 1910s introduced a more flowing silhouette for wedding gowns. Dancing also became a popular part of the wedding celebration, with phonographs providing background music as guests danced the tango, turkey trot, and hesitation waltz. Pictured: Joseph and Susanna Nash, married in the 1910s. Photo courtesy of Diane Forden, Editor in Chief. With the Jazz Age entered a new bridal aesthetic: Waist lines and necklines dropped, and a more streamlined silhouette took hold. Gowns featured ornate beading and embroidery, while bouquets were larger than life. Brides favored Juliet headdresses or cloche hats for their veils. Pictured: Mary and Frank Totter, married in June 1923. Depression-era wedding dresses often were made from rayon, due to its affordability compared to silk. Because of the economic hardship of this time period, many brides opted to simply wear the nicest dress in their wardrobe (often a floral-patterned calf-length dress) or choose a style that could be dyed after the wedding and worn again. Pictured: James and Nellie Fiato, married on June 12, 1932. Photo courtesy of Rita Sadowski, VP/Creative Services Director. Hats were the headpiece of choice for many brides, rather than traditional veils. Wedding receptions often featured Art Deco influences, with décor often seen in a black and white color palette, faceted mirror glass, crystal chandeliers, and marble surfaces. Pictured: Blanche Thomas and John O'Gorman, married in the 1930s, with sister Marguerite Thomas. "The dominant daytime silhouette was one that reflected the practical needs of the wartime woman. Skirts short enough to ride a bicycle, jackets buttoned high to the neck for warmth, lacy sweater to make the wool go further, sturdy shoes, and a shoulder bag," according to Vintage Weddings: One Hundred Years of Bridal Fashion and Style by Marnie Fogg. Pictured: Joe and Helen Forden, married in the 1940s. Photo courtesy of Diane Forden, Editor in Chief. Wedding rings for men became popular during the war as a way to visually connect the couple during the separation, according to Vintage Weddings. A 1940s wedding reception typically featured big band music and the Jitterbug. In many ways, the concept of the DIY bride was born in the '40s: with limited funds available during the war, brides used furnishing fabrics to make dresses (like Scarlett O'Hara in Gone with the Wind), lace curtains to create veils, and paper flowers in their bouquets. Pictured: Rose and Eddie Kaufman, married in the 1940s. Photo courtesy of Jim Duhe, VP/Associate Publisher. The prevailing hair trend: shoulder-length hair piled on top of the head, accessorized with a simple veil. Gowns typically featured rounded shoulders, gathered sleeves, corseted waists, and padded hips. Pictured: Mary and Joseph Perretti, married in June 1947. Photo courtesy of Jim Duhe, VP/Associate Publisher. Gloves were a standard fashion of the '50s, with fingerless bridal gloves made of tulle, lace, or satin. Pictured: Ida Mae and Victor Gustafson, married April 1955. Photo courtesy of Jim Duhe, VP/Associate Publisher. Shorter hemlines led to shorter veils and more attention paid to the bride's shoes. The '50s introduced the sweetheart neckline, first popularized by Elizabeth Taylor in the original Father of the Bride. Many gowns were designed to be worn as strapless evening gowns after the wedding, with coordinating bolero jackets for coverage at the wedding. Pictured: Joan Martino, married on September 14, 1957. Ballerina-length dresses prevailed for brides and bridesmaids, along with short gloves. Pictured: Joan Martino, married on September 14, 1957, with the bridal party. Menswear transitioned in the 1950s to a new silhouette featuring a shorter, single-breasted jacket with narrow, tapered pants. Pictured: Joan Martino and Edward O'Gorman, married on September 14, 1957. Lacy tiers and flouncy frills dominated wedding dress skirts. For Italian-American brides in the 1950s, it was customary to receive a porcelain doll dressed as a bride at the bridal shower, which was to be displayed on the bed after the wedding. Pictured: Joan Martino and Edward O'Gorman, married on September 14, 1957, with their parents, Johanna and Sabbatino Martino (left) and Blanche and John O'Gorman (right). Wedding cakes, often displayed under a floral arch, were styled with popular motifs from the era, like poodles. The 1950s was a decade defined by decorum, elegance, and etiquette. Traditional, classic wedding receptions featured Wedgewood china, white roses, cut glass, and silver on damask cloths. Pictured: Cynthia and Daniel Mines, married on January 12, 1958. Grace Kelly's iconic wedding gown in 1956 further set the tone for '50s wedding dresses. The luxe dress featured a barely-visible sweetheart neckline beneath the lace, with a luxurious skirt. Pictured: Rita and John Sadowski, married on January 25, 1958. Photo courtesy of Rita Sadowski, VP/Creative Services Director. Gowns in the '60s featured high-waisted empire lines, and many brides wore domed pill-box hats with bouffant veils flowing from the hat. Pictured: Elana and Moe Molcho, married on September 17, 1962. Photo courtesy of Paulette Sadfieh, web intern. Weddings during the Space Age often incorporated metallic embellishments. The prevailing flower of the decade was the daisy, which brides incorporated into their bouquets or as embellishments on their dresses. Pictured: Carmel and Sam Doueck, married on August 20, 1964. Photo courtesy of Paulette Safdieh, web intern. Unlike previous decades, the '70s isn't defined by one dominating trend. Gowns in the '70s ranged from hippie frocks to fairytale princess gowns, pantsuits to punk-influenced dresses, and a revival of '30s and '40s silhouettes. Pictured: Nancy Saykaly and John Souaid, married on February 6, 1971. Photo courtesy of Jennifer Lazarus, VP/General Manager. Cathedral trains, lace-edged frills, full-length veils, and oversized bouquets made a comeback during the '80s. Pictured: Audrey O'Gorman, married on May 22, 1982. Flowing sleeves were gathered at the wrist with a deep lace-edged frill. The return of formality in weddings also brought back the traditional morning suit. Pictured: Audrey and Kenneth O'Gorman, married on May 22, 1982. Four-tiered wedding cakes were still standard in the beginning of the '80s, but by the end of the decade, cakes had grown to as many as eight tiers. Complex decorative detailing covered the cakes in this era. Pictured: Michele and Steve Dichter, married on August 27, 1983. Photo courtesy of Rachel Dichter, Fashion Advertising Coordinator. Tradition, etiquette, and formality were the defining elements of an '80s wedding. Receptions often featured gold accents and gardenia flowers. For the first time, couples were able to capture their weddings on video, creating the wedding videography industry. Pictured: Maria and Vincent Sainato, married in 1985. Photo courtesy of Stefania Sainato, Web Producer. Easily the most iconic wedding dress of the 1980s was worn by Diana, Princess of Wales, in 1981. The gown set the paradigm for fairytale finery and influenced the style of wedding dresses for the decade to come, according to Vintage Weddings. With the enormous puffed sleeves, cinched waist, and dramatic train, it introduced a new romantic ideal. Pictured: Angela O'Gorman, married in 1988. Attire for the flowers girls was also influenced by the royal wedding, from the puffy sleeves to the floral crowns. Pictured: Angela and Kevin O'Gorman, married in 1988, with their flower girls. Fueled by the popularity of weddings in pop culture, the wedding industry expanded massively in the '90s. Starting with a remake of Father of the Bride (1991), popular movies centered around weddings included Four Weddings and a Funeral (1994), My Best Friend's Wedding (1997), and Runaway Bride (1999). Pictured: Gina and Michael Grieco, married on June 28, 1992. Photo courtesy of Rita Sadowski, VP/Creative Services Director. As the ornate wedding gowns of the '80s faded, a more minimalistic style gained momentum: a slim sheath dress, exemplified by Carolyn Bessette's bias-cut shift dress for her 1996 marriage to John F. Kennedy Jr.
Pictured: Karen and Scott Gustafson, married in April 1996. Photo courtesy of Rita Sadowski, VP/Creative Services Director. Pictured: Sandra and Domenico Panetta, married in 1998. Photo courtesy of Stefania Sainato, Web Producer. In the '90s, it became increasingly common for couples to throw destination weddings or elope. Pictured: Mary Clarke and Bill Komosk, married December 30, 1999 at the NYC municipal building. Photo courtesy of Mark Clarke, Executive Editor. With more wedding ceremonies taking place in hotels or country clubs, rather than a house of worship, strapless gowns gained popularity. Pictured: Rita Sadowski and Walter Walsh, married on May 4, 2002. Photo courtesy of Rita Sadowski, VP/Creative Services Director. These days, more and more brides are favoring curve-hugging gowns — the mermaid is one of the hottest silhouettes. Pictured: Rachel Brown and Evan Sparkman, married on May 28, 2011. Photo courtesy of Holli B. Photography. Pickup skirts first became popular in the mid-2000s. Modern dresses feature asymmetrical, looser pickups. Pictured: Amanda Weber and Julian Ruedas, married on February 25, 2012. Photo courtesy of Visionyard Photography. Textured details, intricate beading and crystals, and frothy skirts all reign supreme in modern ballgowns. Pictured: Mandy McShane and Christopher Drew, married on August 24, 2012. Photo courtesy of Ashfall Mixed Media, Inc.